There is a rumor that amongst the deep, dark seaweed of the Caribbean there is a very unique pirate’s treasure. She is Bluebeard’s princess, known as Mirabella. She is a mermaid who stole his heart and he brings all the royal treasures to her. Her sweet singing reminding him all along of their silent longing and secret bond. 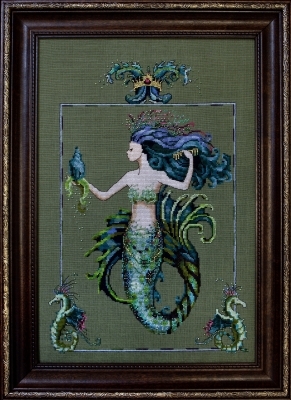 Stitched on 32 count Laurel Linen by Wichelt Imports. Stitched area is 10" by 14.25" with a stitch count of 160 x 228 Stitched 2 over 2. DMC floss used. Blends are one strand each. Note: DMC White and 553 are listed in error. The symbols do not appear on the chart. The owl is honored by its mistress, Athena, for its keen sight in darkness. 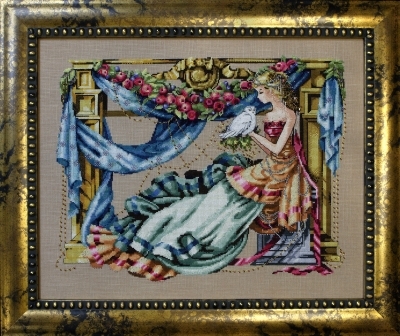 An air of opulence abounds as wistful sweeping swags of tapestries gracefully intertwine. It is a picturesque retreat infused with exotic beads and crystals. The most treasured of which is the magical “inner light” of the owl that reveals unseen truths and wisdom. Stitched on 32 count Chestnut Linen by Wichelt Imports. Stitched area is 15.75" by 12.58" with a stitch count of 251 x 197 Stitched 2 over 2. DMC floss used. Blends are one strand each. This free holiday design from Nora Corbett is easy to stitch, easy to give and easy to love all year ’round. 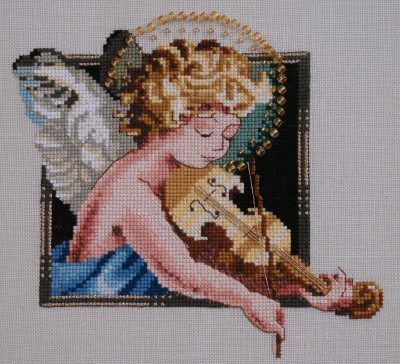 And know while you’re stitching that everyone at Mirabilia Designs is wishing you the heavenliest of holidays! Next in the series of the lovely birthstone beauties is the Topaz Fairie. She has iridescent dragonfly wings that carry her in a pale lemon chiffon dress. She is harvesting the las crimson blooms of summer to brighten her winter days. The citron stones and sparkling beads crown her the Fairie Queen of November. Stitched on 32 count Belfast Cream Linen by Zweigart. Alternate fabric 32 count Ivory Linen by Wichelt Imports. Stitched area is 11 1/4" by 14 3/4" with a stitch count of 178 x 223. Stitched 2 over 2. DMC floss used. Blends are one strand each. The legend of the mermaids of Atlantis can be traced back as far as the eight century BC. She swims about the marble halls, greek columns and ascending stairs covered in coral. Such beauties are the keepers of pirates treasure and the caretakers of the lost city of Atlantis. Although they have never been caught there have been many, sightings near rocky cliffs and the waves at dusk. 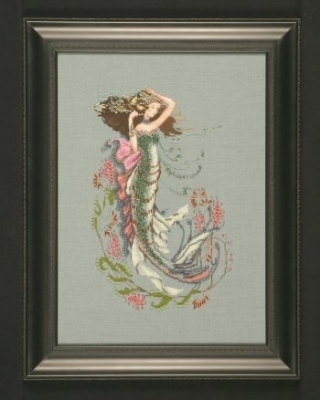 Model was stitched over two threads on 32 count Laurel Linen by Wichelt Imports. Alternate fabric 32 count Olive Green Linen by Zweigart. 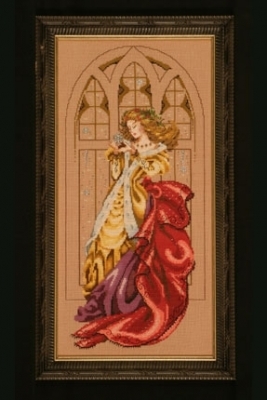 Stitched area is 7 1/2" x 15 3/4" with a stitch count of 120 x 249. Stitched (2 over 2). DMC floss used. Blends are one strand each. In this ballad of needlework the crystals hang from the chandelier like notes on a page. there is an orchestra of dark, dramatic roses and heirloom pearls playing on the gown of a lady in white. 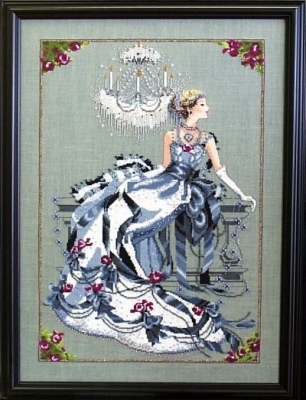 Each stitch is a musical note from the overture to the closing of this dramatic opera. 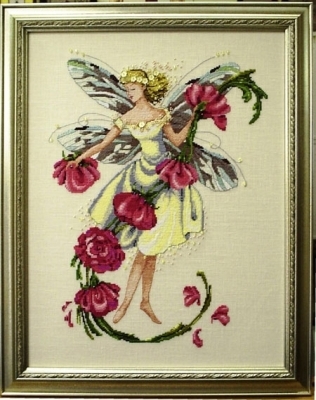 Model was stitched over two threads on 32-count Stoney Point linen by Wichelt Imports. Stitched area is 11 1/2" by 17 3/4" with a stitch count of 182 x 282. In the garden at dusk is where you find the “Lady of the Mist”. She is usually surrounded by many petaled mossy roses. The petals are crushed beneath her feet and their heavy scent is thick in the air. The crickets sweet symphony accompanies the sound of her rustling satin gown. You can see her when the blue moonlight reflects across her pale skin. Why she chooses to linger in such a place is a beautiful mystery. 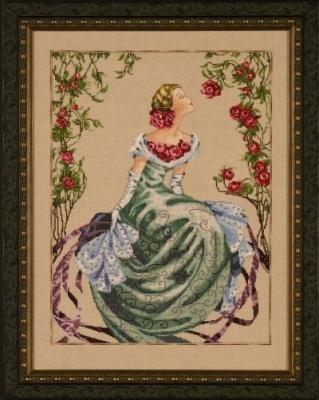 Model was stitched over two threads on 32-count Natural Brown linen by Wichelt Imports. Stitched area is 14 1/2" x 19 1/2" with a stitch count of 230 x 310. 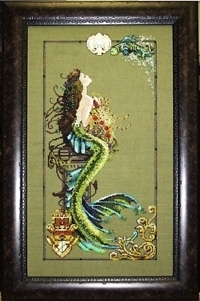 She lives in the warm seas of the South and watches over her precious aquatic garden. Her tail shimmers in the reflective light of her coral castles. When she plays in the azure water, you may catch a glimpse of her pearly veil. Stitched on 32 count Amsterdam Blue Belfast Linen by Zweigart Manufacturing available through Wichelt Imports. 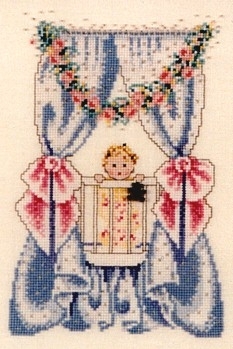 Stitched area is 8 ½" x 13 3/8" with a stitch count of 138 x 213. Stitched (2 over 2). DMC floss is used. Blends are one strand each. Braid is one strand. Planting bulbs, covering perennials, and harvesting the end of summer pumpkins are all joys near to a gardener’s heart. 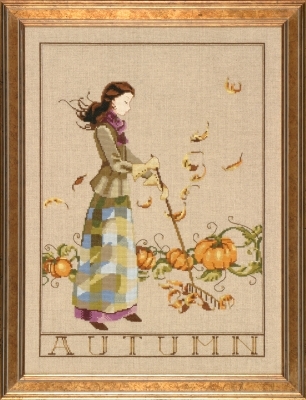 The fourth design in our garden series celebrates autumn in all it’s windblown glory. Hang all four together or one at a time to beautifully illustrate the changing seasons. 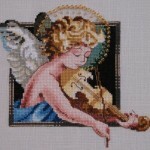 Stitched using 32 count Natural Linen by Wichelt Imports. 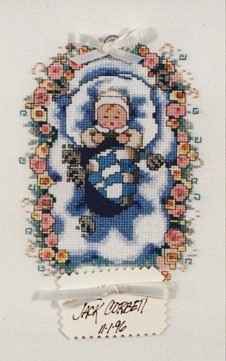 Stitched area is 11 1/4" x 16 1/4" with a stitch count of 180 x 260. Stitched (2 over 2). DMC floss used. Blends are one strand each. On Christmas Eve the Gothic windows were laced with frost. Icicles gleam as the snow flutters in silence. A lady in red cups her hands around a single snowflake and tiny crystal snow drops are scattered across her plush, velvet cape. May all of your Christmas Eves be filled with magical beauty and peace. Stitched on 28 count Country Hazelnut Linen by Wichelt Imports. Stitched area is 9 1/2" x 20" with a stitch count of 130 x 281. Stitched (2 over 2). DMC floss used. Blends are one strand each.